Beetroot constipation supplies more water soluble fibre for the large bowel. It's God’s gift to the colon. The young taproots, about the size of a golf ball, are just the most delicious and simple solution to a serious health problem. It has a form of natural soluble fibre that makes the stool soft and easy to pass; so they are the very best cure for chronic sufferers of you know what. It's is a serious problem. Toxic bowel material needs to be passed every day or, allowed to build up in the colon, leads to many intestinal diseases including colorectal cancer and diverticulitis. It's also one of the many contributors to the question of what causes headache? Hence my interest as a chiropractor; about ten to twenty percent of any practice is made of patients suffering from misery in the upper neck and head. Anything less than a daily bowel movement should be considered abnormal, in my opinion, but the official guidelines are a lot less strict; hence the epidemic of fatal colorectal cancer. It's the soluble fibre fraction in beetroot that is so friendly to the colon. For the same reason apples too have proved very effective in the treatment of bowel diseases; they too are full of soluble fibre. Three quarters of this pectin is in the peel, remember. There's heaps of strong evidence which you can study at our apple page. Use the search function in the navigation bar. Beetroot constipation is God's gift to the colon. If you don't look after your body, where are you planning to live? 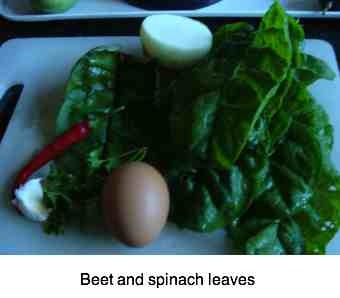 Spinach and beetroot leaves for constipation. Prunes, your grandmother's first choice in the treatment of constipation, like beets have both soluble and insoluble fibre. Plus, unlike this page about beetroot for constipation which is purely my opinion, prunes have been scientifically proven to be more effective than medicine's first choice of treatment. Read more below at our quick constipation relief page; or use the search function in the navigation bar on the left. Chiropractic help is a very large site of over 400 pages dedicated to better health; finding your way around is difficult but the search function in the navigation bar is a great help. Type in topics like low gi bread or how to grow spinach; you'll be surprised what it'll toss up. Both beet and spinach leaves incidently are excellent; first fry up half an onion and a couple cloves of garlic and then toss in the tops; I like to take the main stem out if they are large and a bit old. Brush your teeth after the meal by the way; they get coated by some natural acid. Perhaps throw in a couple stalks of fresh parsley and a slither of chili; drop an egg onto the leaves whilst they are steaming and you have the perfect breakfast; enjoy it on low GI bread smothered in butter. The Italians call this eggs Florentine; the perfect, healthy solution to constipation. It's the water rich and fibre dense plants that are a large part of the solution. It's all in the phytosterols. Food scientists are now doing intense research on these substances. They are the vegetable equivalent of animal cholesterol; and the beetroot diet is loaded with them. Phytosterols have now been proved to reduce the bad fraction of blood cholesterol; the low density lipoproteins. More, they have been proved to reduce the nasty, nasty symptoms of an enlarged prostate, reduce joint inflammation, and inhibit the growth of cancer cells. Research is now being done to see if phytosterols can be used to cure and not only prevent cancer. Really, what more do we want? The proven benefits of beetroot are vast. Beetroot for constipation, even the ancients knew it. The beetroot diet was used by the ancients, but somewhere modern health care dropped the ball. They used it for the treatment of malignant growths, liver conditions, anaemia, ulcers, low blood sugar, in addition to beetroot constipation. There are many cleansing diets using raw beetroot juice; it's reported to give quite a high. Raw honey, generally not what you can buy in the supermarket has also been used for years for constipation, though I know not what the active ingredient is. The heating processing of honey denatures enzymes turning it into something not much better than sugar. Raw honey makes you more fertile, too, beware! Read more at infertility chiropractic. For more about the benefits of phytosterols read this article from ehow. Avos too are rich in fibre, and healthy fat; in the old days you'd be given a cup of castor oil for constipation. Rather eat avocados regularly; along with the olive they are best source of oleic acid, vital for your nerves. Plus they help keep you regular. Let your food be your medicine was the advice given by Hippocrates to his patients; it's still the best recommendation. Gently massaging the abdomen, starting in the right lower quadrant, as it's called, following the line of that grey structure; it helps to stimulate a lazy colon. It's proven that exercise like walking is a good add on to beetroot for constipation. It's good for your bones and your back; your chiropractor will approve! Walk as briskly as you can, then it's proven to reduce the risk of Alzheimer's disease too. An astonishing 50 percent of Americans are taking so called anticholinergic drugs. One of their many serious side effects is constipation, as they block the neurotransmitter acetylcholine that enables nerves to talk fluently to the smooth muscle in your colon. The result? Constipation. Anticholinergic side effects are serious business; they are known as iatrogenic illness in medical terms which means doctor caused disease; if you're taking them make sure you're getting beetroot for your constipation. Prunes too, of course, and nothing like a good green salad. These drugs include codeine and sleeping tablets. Here are some more healthy Living Tips; one of the benefits of beetroot for constipation is that it is rich in natural iron and is excellent for women suffering with anaemia. Recent medical research in Holland has started asking questions about the overuse of iron supplementation; there are concerns. So if you are anaemic, perhaps take less iron tablets and eat more beets. Aphrodite, the Greek goddess ate beets apparently to retain her beauty! You’ll remain beautiful too. Think beetroot for constipation and all the other benefits. They are what as known as a functional food, preventing disease and promoting health. Beet greens are delicious, incidentally. I think they are much nicer than their first cousin spinach. Don't dump 'em; cut off the stalks and steam them lightly. They too are lovely and healthy and full of the selfsame carotenoids that protect the eyes from lutein macular degeneration; one cup provides 15 percent of your daily needs or iron. Legumes like chickpeas are the best source of iron; we enjoy homemade quick hummus every day. We prefer them to spinach by the way with a little melted butter; yes, butter is back. The fat also helps with the absorption of the invaluable carotenoids. Choose young beets because the hard, old woody ones are not very nice. They are so sweet; that's why one variety is used for sugar. They too are delicious, incidentally, if you can lay your hands on them and, with a little butter, absolutely scrumptious. Mostly they are either turned into sugar or to cattle feed. You have to know a farmer to get them; they would work equally well as beetroot for your constipation. Again, don’t forget the leaves; they make a delicious spinach. You will probably have to sort out the bedraggled stems and sometimes plants that the fungi too have taken a liking to. All in all, beetroot constipation is a simple way to get on top of a horrid condition. Cooking them doesn't need to be a problem if you have a pressure cooker; the benefits are vast. One excellent way to enjoy them is pickled; it's dead easy. For a simple pickled beets recipe follow this link; make a delicious, healthy salad. World's healthiest foods on beet greens makes interesting reading; look at the comments on betaine too. Using a bread machine you can rustle up a loaf in only five minutes, plus five hours baking; the divine aroma is part of the deal and comes for free! My five year old granddaughter has just come in from school and commented on the heavenly smells coming from grannies kitchen; it's the bread baking. One other great advantage of 100% whole wheat used in tabbouleh and bread is that it reduces cardiovascular disease by 9%; it's because of the betaine found in the germ and in beets. This choline metabolite is vitally necessary for the breakdown of highly inflammatory homocysteine. Read more about choline food sources. Drinking water,though I confess the research if very weak that more water helps with constipation. 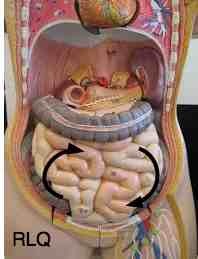 I should hasten to say that I have no scientific evidence that chiropractic sacroiliac adjustments help constipation. I have just observed it over the years. As Carl Sagan was want to say: "Absence of proof is not the same as proof of absence." 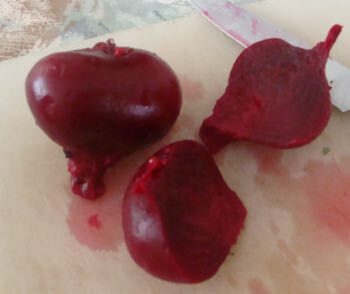 First think beetroot for constipation, and only then a stimulatory manipulation of the SIJ. But there's strong proof that more fibre and in particularly beetroot constipation is a big help. Chiropractic Sacroiliac Joint treatment; only anecdotal evidence there too. THAT CHIROPRACTOR SAVED MY LIFE. AFTER YOU WAS BORN, MY COLON WAS IN BAD SHAPE. POP TOOK ME TO 5 MEDICAL DRs, NO HELP. WENT TO DR. BARKDOLL, IN REED CITY. I GO TO THEM 4-5 TIMES a YEAR, I'M DUE IN SEPT FOR THE NEXT CONSULTATION. Received from R in response to our newsletter which she forwarded to her mother. Signed up yet? You'll find the place at the bottom of the page. Forwarded any of our newsletters to your mother? IT'S EXTREMELY IMPORTANT TO GET ON TOP OF CONSTIPATION ... DO NOT NEGLECT THIS MOST SERIOUS HEALTH CONDITION. Otherwise you'll be finding red blood in the stool; it's usually just a benign haemorrhoid, but it must be checked. The incidence of colorectal cancer is rising in leaps in bounds since folk gave up on natural living. Oats is generally accepted as the best source of soluble fibre for lowering blood cholesterol. It will also do wonders for constipation; Quaker oats recipes ... EVERY! morning in winter. In summer have eggs florentine instead, and by way of variation. If you have five minutes every day, then you might think of making this low GI bread; it's so easy, but you do need a bread machine, be warned it's apparently the most underused kitchen utensil. But we bake bread nearly every day; the heavenly aroma of baking bread alone makes it worthwhile! It has all the right ingredients to give you quick constipation relief. Try these lower back exercises too from Chiropractic Help; simply mobilising the spine and sacroiliac joints might help. Good to do in any case; if it doesn't provide quick constipation relief, it's guaranteed to give you protection and relief from back pain. Whilst there are many causes of headaches from a long day in the sun, to one too many at the nineteenth, the majority are caused by a problem in the upper neck or jaw joint. However, constipation is certainly a contributory factor. What causes Headache? Could beetroot constipation be the cure for your headache? It's all about fibre, and the water soluble fibre is best. Bran for example is not a particularly good solution for constipation, particularly as it adsorbes calcium, making it a no-no for women in particular; think rather prunes or beetroot constipation for a solution to the worst nightmare. All fruit, salad and veg have plenty of fibre in; if you're suffering from constipation, then you simply have to take a good long look at what you're not eating, and what drugs you are taking. Go from BEETROOT CONSTIPATION to OLIVE GARDEN NUTRITION for more healthy fibre and oil. Plenty of fibre in our delicious Mutton Stew ... and some cholesterol if your's like mine is dangerously low! One of the many benefits of beetroot is their rich purple colour. The phytosterols in coloured fruits and vegetables are what keep our cholesterol in order and lessen our chances of getting cancer. Think too of an apple a day; more at our apple diet page on the very real benefits of apples. It's not just an old wives' tale. Research following greenies over a twenty year period proves that eating eight or more coloured foods every day reduces the all causes of death by a very impressive 35%. That's massive.